On Sunday morning, December 7, 1941, American neutrality in World War II ends when Japanese forces conduct a surprise attack on the U.S. naval base at Pearl Harbor, Hawaii. 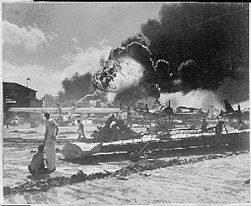 Over 400 planes from six Japanese carriers bombed the harbor and airfield, and within two hours much of the American Pacific fleet was rendered useless. Losses were devastating: Five of eight battleships, three destroyers, and seven other ships were sunk or severely damaged, and more than half the island’s aircraft were destroyed. Fortunately for the Americans, all three U.S. Pacific fleet carriers were out at sea. A total of 2,400 Americans were killed and 1,200 were wounded in the attack. Japan’s losses were 29 planes and four midget submarines. The next day, Japan attacked the Philippines, Malaya, Thailand, and Hong Kong, while Britain and the United States declared war on Japan.